"A light and refreshing salad perfect for a warm summer evening. I like to serve this as a side with Mexican meals." Spread 1 teaspoon butter on each ear of corn and sprinkle ears with garlic powder. Wrap corn in aluminum foil. Grill wrapped ears until corn kernels are hot and steaming, about 15 minutes. Unwrap ears and grill until kernels are lightly browned, about 5 more minutes, turning once. Let corn cool and cut kernels from the cobs. 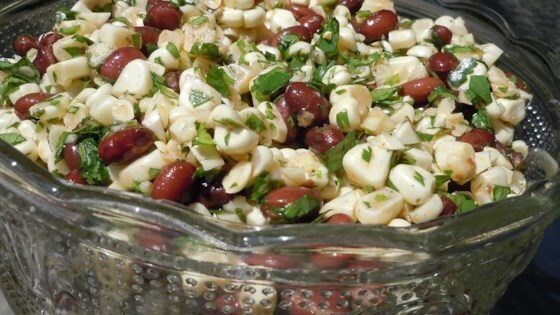 Gently stir corn, black beans, and cilantro together in a salad bowl. Whisk olive oil, red wine vinegar, lime juice, garlic, sugar, cumin, chili powder, salt, and black pepper in a separate bowl; pour dressing over corn mixture and toss gently to coat. I made it just as described except I added just a tiny bit of chopped jalapeno to give it a little punch. Very good and super easy recipe.